Music composed, arranged and performed by Vangelis. Dimitris Tsakas on alto sax. 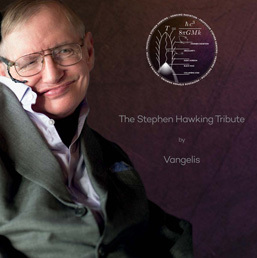 Lyrics: The Words are written and cited by Professor Stephen Hawking (computerized voice of Professor Stephen Hawking).© The Stephen Hawking Foundation! This is a very limited edition. The original CD is not a factory pressed CD, but a burned (duplicated) CD-R in itself. The CD with the music, titled "The Stephen Hawking Tribute" was handed to everyone attending the Service of Thanksgiving at Westminster Abbey when Hawking's ashes was interred at this church in London. This ceremony took place on Friday June 15 2018 and was attended by invited guests, as well as 1000 members of the general public, who where selected by a public ballot. This Vangelis' music was beamed towards a black hole closest to our planet (where it will be received in about 3,500 years) from the European Space Agency (ESA) ground station in Cebreros, Madrid (Spain), at 12:00 noon that day. “I am very aware of the preciousness of time. Seize the moment. I have spent my life travelling across the universe inside my mind. Through theoretical physics I have sought to answer some of the great questions but there are other challenges, other big questions which must be answered, and these will also need a new generation who are interested, engaged and with an understanding of science. How will we feed an ever-growing population, provide clean water, generate renewable energy, prevent and cure disease and slow down global climate change? I hope that science and technology will provide the answers to these questions, but it will take people, human beings with knowledge and understanding to implement the solution. One of the great revelations of the space age has been a perspective that has given humanity on ourselves. When we see the earth from space we see ourselves as a whole; we see the unity and not the divisions. It is such a simple image, with a compelling message: one planet, one human race. We are here together, and we need to live together with tolerance and respect. We must become global citizens. I have been enormously privileged through my work to be able to contribute to our understanding of the universe. But it would be an empty universe indeed, if it were not for the people I love and who love me. We are all time travellers journeying together into the future. But let us work together to make that future a place we want to visit. Be brave, be determined, overcome the odds.